Fabulous light and spacious family home on a quiet tree lined street backing on to Molesey Heath and with direct access to the pretty River Mole that runs through Surrey. Perfect for families & groups planning a visit to Hampton Court Palace and London. Cosy in winter and great for entertaining and families in summer. 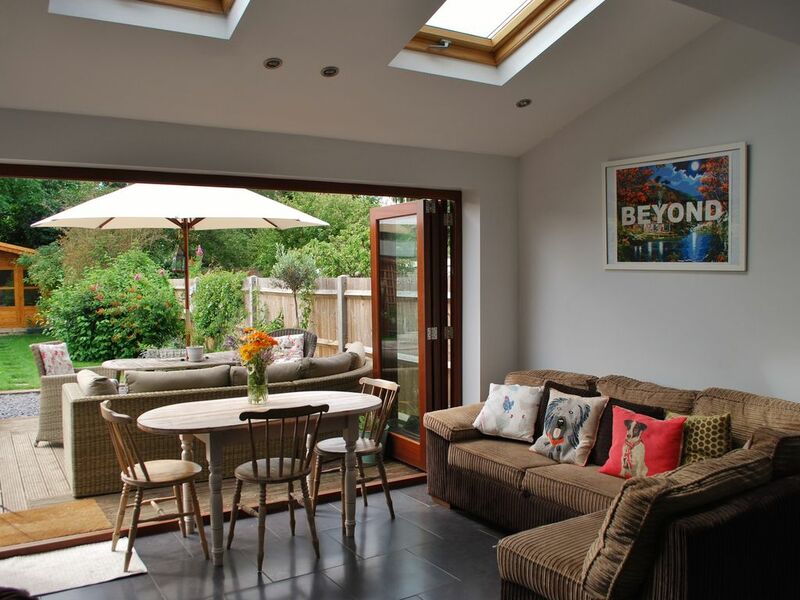 Bright sunny family kitchen with lovely direct south facing decked area and mature and very private garden. The neighbourhood is very tranquil and scenic. The garden backs on to the river and Molesey Heath which is a nature lovers paradise. It's also one of the best areas in the whole of greater London, if not the best, for dog lovers! Amazing parks and river walks on the doorstep. You're also only a short stroll from great cafes, restaurants, quirky antique shops and of course the famous palace and train station with direct trains in to Waterloo in 35 mins. It really is the best of both worlds! House is well equipped with all mod cons and TV in lounge and kitchen. House also has high speed Fibre optic broadband. In terms of transport it's a 15-20 minute walk to Hampton Court (London zone 6) train station or a £5 taxi ride. There are also local buses right outside the house that go to the station and Kingston or Richmond. 35 minutes from Central London with direct train to Waterloo. I work in media and events and as such travel an awful lot but i always love coming back to this area. I chose it because you can get in to central London in just over half an hour from Hampton Court and you have the buzz of the shops and restaurants near the palace, but you also have the great parks and river walks. It really is the best of both worlds. Very close to Heathrow and central London but bordering picturesque Surrey and if you want to go to the beach in Brighton you are only a short drive away through amazing Surrey and Sussex villages. The house is a lovely 1930's conversion with all the charm of a period property but a fantastic modern south facing kitchen and garden. Great decked area where you can fling open the kitchen doors, put on some music and sit in the incredibly quiet garden. With nobody overlooking you and only the river and nature reserve for miles you really wouldn't know you were so close to London. The house is really comfortable. The kitchen is well equipped and easy to use. The fireplace in the living room makes a rainy winter day so much nicer. The nearby green spaces are great for dogs. Oliver was very flexible and accomodating. Thanks for a great stay. Quite dated and not very comfortable or clean. This is a very comfortable well appointed home with a great outdoor entertaining area adjoining the bright and spacious open plan kitchen dining area. The three good sized bedrooms and bathroom are upstairs, with sitting room and second loo downstairs. The house is in a nice location close to the river Mole and parklands, with shops and transport nearby. Molesey is a great area to stay as only 30mins direct train to the city with rural Surrey and Berkshire right on your doorstep. All in all we very much enjoyed staying here and would recommend it. This house was perfect for our five-day tour of London and vicinity. The house is only minutes away from Hampton Court Palace, which we toured on two days using our Historic Royal Palaces membership pass. The other three days of our stay we went into London, an easy commute on the train (the train station is right next to Hampton Court, so again, just a couple minutes' drive from the house). We found the house to be very clean, spacious, with a well-equipped kitchen for cooking. Dishwasher, clothes washer and dryer were also a plus. The lush, private garden was a welcome retreat after a busy day in the city. The residential neighborhood is completely silent, but close to a nice little "downtown" with plenty of restaurants and shops. Though we were too busy to use it, there is a nice park across the street. We had a lovely 3 weeks at Olivers house - family of 4. It has absolutely everything you need in a very nice residential area a short walk from shops and Hampton court. We couldn't have asked for a better place - really home from home. Oliver and Kasia were very friendly, helpful and accommodating. Great hosts. we could recommend as a relaxing and beautiful place to stay. We have decided not to charge a cleaning fee instead we ask that you respect the house and tidy up after yourselves, leaving it as clean as possible i.e as you would leave a friend or relatives home if you were staying. If the house is left excessively messy or dirty we will charge a £50 cleaning fee that will be taken from the deposit.